The MagicHeal Add-On for TransMagic now includes a powerful set of tools that help you with detecting and correcting non-manifold geometry. This is important because failing to detect non-manifold geometry can lead to problems downstream, when you are trying to use that geometry in a CAD system (such as SOLIDWORKS or Solid Edge) that does not support non-manifold geometry. Manifold is a geometric topology term that means: To allow disjoint lumps to exist in a single logical body. Non-Manifold then means: All disjoint lumps must be their own logical body. See a more detailed description of non-manifold geometry in this article. Show Non-Manifold: As shown in the figure, Show Non-Manifold highlights edges or vertices that are considered non-manifold, and highlights neighboring faces as well. Unhook Non-Manifold: Unhook Non-Manifold selects all faces associated with the non-manifold condition and unhooks them from the main body. In the first example in the video, the user simply unhooked the faces near the detected non-manifold vertices. This simple action makes a huge difference in the downstream application (SOLIDWORKS, in this case), in that the user now has a single imported body to deal with rather than thousands of separate surfaces. In the second example, the user deleted an unnecessary face and thereby resolved the issue. 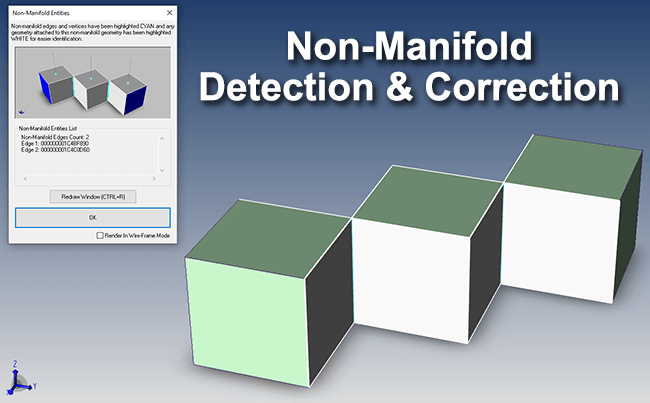 In both cases, the Detect Non-Manifold saves the user time by locating and highlighting where non-manifold conditions exist. Parasolid-based CAD systems (such as SOLIDWORKS and Solid Edge) disallow non-manifold geometry, whereas ACIS-based CAD systems (such as Inventor and IronCAD) allow non-manifold geometry.